Lucy Crossfield takes a look at our first selection of the world’s finest homes: some of the most exotic, luxurious and unique houses money can buy and all outstanding examples of architectural prowess. 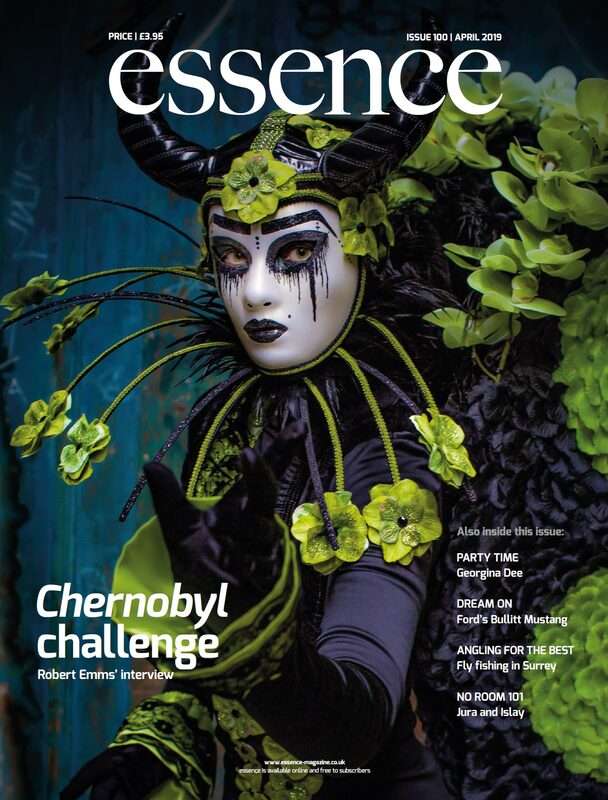 Part 2 to follow in the next issue. Inspired by the flint found in surrounding fields, Flint House is unparalleled in its craftsmanship. It was commissioned by the illustrious Rothschild family, while architect firm Skene Catling de la Peña conceived the initial idea for the structure and oversaw the whole project. The result is flawless. Two unique wedge-shape buildings emerge from the Waddesdon estate, pointing away from each other to form the ‘V’ of a valley. Clad in flint, the country house features a stepped roofline with many terraces and tiny crevasses that create the building’s unusual silhouette. The interior reflects Lord Rothschild’s love for rare and exquisite collections as distinctive art pieces and sculptures pepper the whitewashed walls. 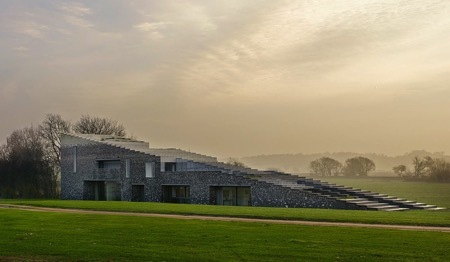 Flint House has been applauded by many for its impeccable stonework and masonry. Formal recognition has come in the form of winning the prestigious RIBA House of the Year in 2015, and having been shortlisted in the World Architecture Festival’s Best House category. 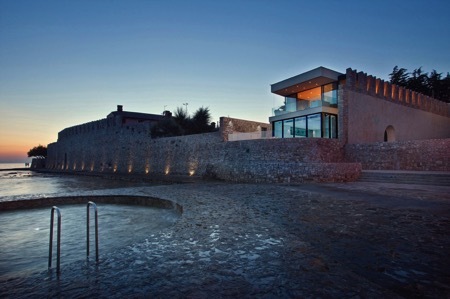 Located in the medieval town of Novigrad in Croatia, House Sperone blends seamlessly into its historic surroundings. The architects and designers of House Sperone hoped to create a property that represented a perfect fusion between old and new. They worked to carefully retain the house’s sense of character and allowed historic features, such as the stone walls, to shine through. At the same time, House Sperone is not short of modern creature comforts. The ground floor is occupied by a spa, sauna and stunning infinity pool that appears to melt into the sea beyond it. The interior decor is kept simple and clean, with natural materials and neutral colours used throughout to reflect its coastal surroundings. Japanese architect Terunobu Fujimori is renowned for designing unusual buildings, and his Teahouse Tetsu treehouse certainly serves to uphold his reputation. 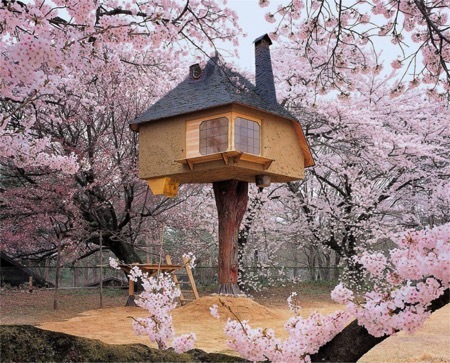 The fairytale-perfect property was built as a traditional Japanese teahouse, and is perfect for those wanting to enjoy the cherry blossom in full bloom. Its single supporting leg is built from a cypress trunk. Amazingly, the trunk is supple enough to bend significantly, so much so that it is capable of withstanding earthquakes and storms. Access to the treehouse is by a small platform, rope ladder and trap door combination. Once inside, the interior is left simple and clean so as not to detract from the beauty outside. Elora Hardy left a successful career in New York’s fashion industry to set up Ibuku, a design firm that specialises in luxury bamboo structures. 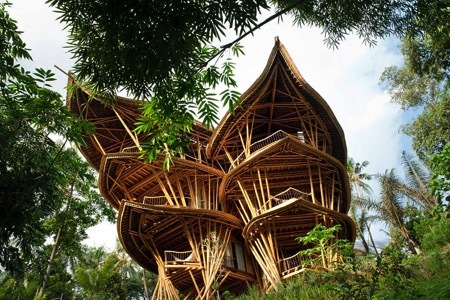 As a building material, bamboo is relatively underused but, Elora believes, is one that is incredibly valuable. Bamboo has the strength-weight ratio of steel, the compression force of concrete and, most importantly, it is a renewable resource. Sharma Springs is situated in the Green Village – a community designed by Elora and her team that features 18 unique, custom-designed bamboo homes. Sharma Springs represents the most ambitious and luxurious of Elora’s bamboo projects. It is six storeys high with four exquisitely crafted bedrooms. All rooms are naturally open to the elements, and many of the property’s modern features, such as televisions, have been expertly concealed to ensure total immersion into the jungle environment. 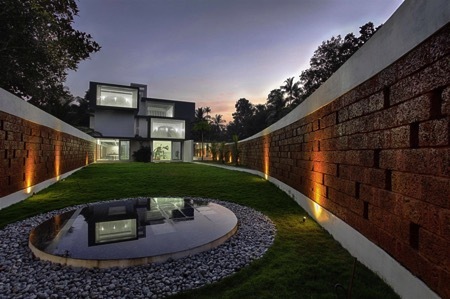 Perhaps the most striking feature of this Indian property is the huge laterite stone wall that winds its way through both the gardens and the house. The wall serves a dual purpose. Not only is it a security feature – the owners of the property wanted to create a highly secure enclosure – but also serves as a flowing sculpture throughout the landscape. The great expanse of wall is broken up by small vertical rectangles, allowing passers-by to catch glimpses of the luxurious property inside. The architects designed the property’s interior to be practical without foregoing style. Most of the rooms have mix-matched ceiling levels to encourage natural ventilation, while on the floor the property boasts several indoor pools and water features to further promote a cool environment. The architects of Melbourne’s most unusual suburban home hoped to create a property that resembled a ‘giant puzzle’. 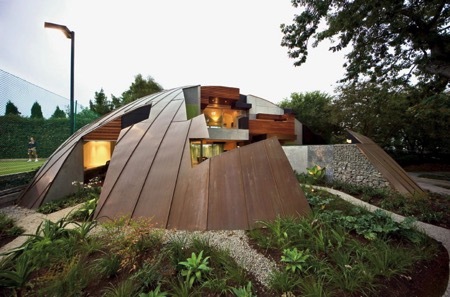 The Dome House began life as a giant copper sphere, which designers then hollowed out and removed chunks and slices to create its unique structure. Fundamental to the property is its relationship with the surrounding garden. The largest slice of the property was taken from the front entrance, in turn allowing the garden to wind its way almost to the front door. Hidden amongst the panels and walls are a plethora of eco-friendly features. The curved roof features a series of gutters and rainwater tanks. The hot water system is powered by solar panels and the windows are double-glazed throughout to minimise energy wastage. The House at Hanging Rock is an exceptional property. Situated deep in a Melbourne nature reserve, the house enjoys unrivalled views of the Australian landscape, with the notorious hanging rock visible in the distance. Architect Kerstin Thompson worked closely with her clients, one of whom is a professional artist, to capture their love for texture, light and materials within the property. Concrete is used extensively throughout the house, and not just for its aesthetic qualities. The dry air and soaring temperatures common to the Australian bush mean it is imperative that each building is as fireproof as possible – for which concrete is an ideal material. The interior palette is dark and dramatic, with a definite industrial edge. Again, the emphasis inside is on simple materials. 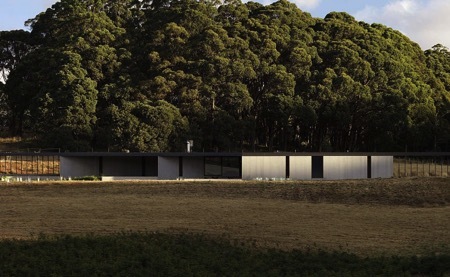 The property makes use of wood, glass and metals – in keeping with its rural surroundings. This article first appeared in The Lux Pad, www.amara.com/luxpad.